The What: Crestron has added the DM Multi-Window Video Processor (HD-WP-4K-401-C) to its line of DigitalMedia “plug-in and present” simple room solutions. The HD-WP-4K-401-C is a solution for displaying up to four 4K60 video sources simultaneously on a single HD, Ultra HD, or 4K display. Video windowing enhances the presentation and collaboration capabilities of any meeting space, while saving cost by allowing more video sources to be viewed on fewer displays. The What Else: The HD-WP-4K-401-C is engineered to deliver a professional onscreen experience with 4K video quality and smooth transitions. Using Automatic mode, the screen configures itself based on the number of connected sources. PIP (Picture-In-Picture) windowing is also supported. The size and location of the PIP window can be managed at setup or while in operation using the front panel controls, a web browser, or a control system. For easy identification, each video window can be designated with a custom text label. An additional text field can be positioned at any location to display a static label or dynamic pop-up message from the control system. For branding purposes, a company logo can be placed at any location on the screen. 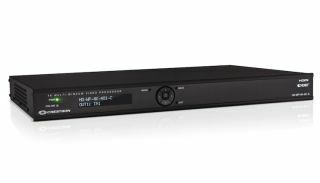 The HD-WP-4K-401-C provides parallel HDMI and HDBaseT outputs for flexible connectivity to the display device and other equipment. They can be used simultaneously, providing identical signals at each output. The HDBaseT output is also compatible with DM receivers, switchers, and the Crestron DM-DGE-200-C. Input sources up to 4K are supported via four HDMI inputs. Up to four Crestron Connect It Cable Caddies (TT-100) can be added for convenient BYOD connectivity and collaboration around a conference table. Meeting participants simply press the soft-touch button on their cable caddy. Four USB ports on the HD-WP-4K-401-C provide power and communications for each cable caddy.